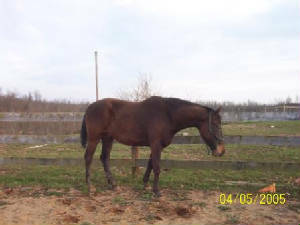 Brenda adopted 2 foals. Here is the story about them. My NMF's were 6 months old when I got them. 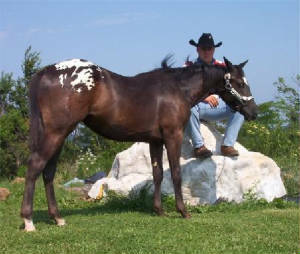 That's why they don't look too small in the 2003 foal pictures. I was told that originally the nmfarmer was going to keep them in the herd, then decided to let them go to CCHRA. I brought them home in February 2003 (they were born in Aug.2002) and they were wild as March hares. I couldn't even touch them without them trembling in fear. My experiences are much different than those of the bucket babies. 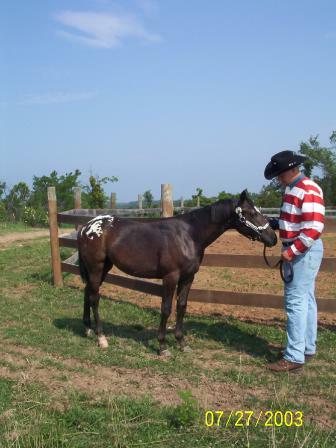 Mine were weaned, had never had their feet trimmed, no vaccinations, etc. The bonding process took months...But I now have two big rascals who love to be touched, brushed, hugged and kissed. 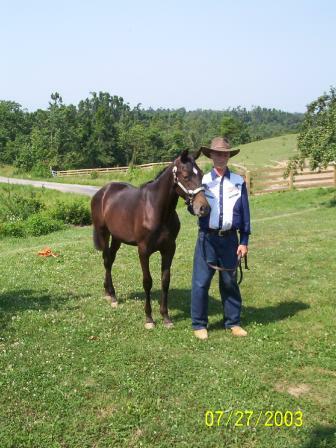 Chance & Cash were entered in the County Fair and for first timers they did extremely well. Chance placed 3rd and Cash placed 4th in a class with seasoned show horses.